to all the newly engaged couples over Christmas and the new year from us at wedding cake toppers. Exciting times are ahead for you. Some of you may be planing a 2018 wedding, or some of you might be thinking more long term. Whenever you are thinking it is always sensible to decide if there are bespoke things that you are hoping to have and book ahead. Some personalised wedding supplies book up months or even years ahead. So don’t panic! But maybe take a bit of time to decide the basics. Here at Atop of the tier we can book up especially for the summer months. Surprisingly September is so far one of the busier months. 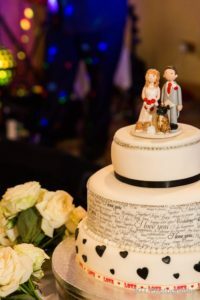 Our cake toppers are personalised to match you on your special day. They are crafted from ceramics, so will last forever. They are a lovely centre piece for your special day, then a lasting keepsake to treasure. Both are ceramic and made to match you, your pets, your hobbies and more! 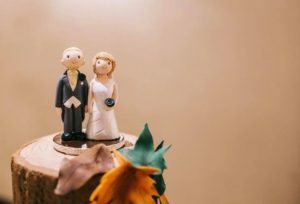 I am very lucky, that I have been sent these lovely photos of cake toppers on the wedding cakes. It’s always great to see them in action!